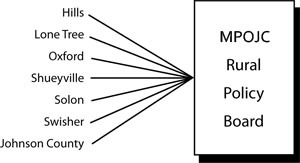 The MPOJC Rural Policy Board includes representatives from all incorporated areas in Johnson County outside of the Iowa City Urbanized Area. Also included is Johnson County, representing the unincorporated portions of the county. All representatives are elected officials, and at least one of the two Johnson County Supervisors on the Rural Policy Board must be a representative of the Urbanized Area Policy Board. Planning assistance to small communities was provided directly by MPOJC staff until the mid-1980's. Since that time it has been funded by MPOJC but provided through an agreement with the East Central Iowa Council of Governments (ECICOG), a six-county regional planning agency which includes Johnson County. Meetings of the MPOJC Rural Policy Board are held on an as-needed basis at least once a year.